Screwy Calc (at right) uses the Original Gravity (OG) and Final Gravity (FG) temperatures to calculate the residual CO2 volumes of your beer. 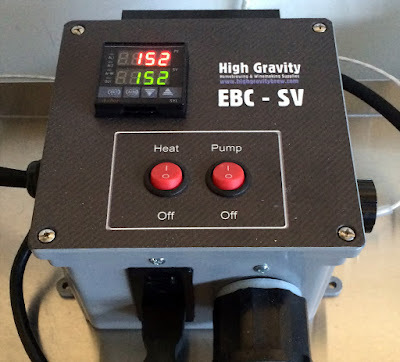 Specific gravity temperature corrections are also applied to calculations of calories, carbohydrates, attentuation, extract, Plato and yeast pitching rates. Yeast pitching rates are calculated in billons of cells. The formula uses adjusted final gravity Plato and wort size in gallons to determine how much yeast should pitched for either Ale and Lager type beers. This free beer recipe calculator is intuitive, easy to install and fun to use. Use it to automatically calculate the gravity, color and bitterness of your own recipes. Download it today and also get Screwy's database including the latest Mr. Beer ingredients. Enter the full specific gravity (SG) readings including the decimal point and the percentage of alcohol will be calculated when you click on the submit button. The first reading is of the beer in your fermenter, before you start the fermentation process. Take this reading when all the water has been added and you are ready to pitch the yeast. Pour a sample out of the tap into a test flask and set it aside to cool to about 70F (20C). The second reading is of the finished beer. This is taken when you are ready to bottle your beer and this too should be about 70F (20C). A certain amount of Residual CO2 remains in the beer after the fermentation has completed, depending on the fermentation temperature. An ale fermented at 65°F will have 0.9 volumes of residual CO2 while a lager fermented at 50°F will have 1.2 volumes. To get the same carbonation in these two beers would require different amounts of priming sugar. Too much priming sugar or bottling a batch of beer that is not done fermenting can cause exploding bottles so don't carbonate bottles to higher pressures than the beer that came in them and exercise caution when entering numbers and using the results from this calculator. The apparent attenuation you will get on a given batch depends on a number of factors, including the types of grains/extracts used, mash temperature (if brewing all-grain), and the strain of yeast. Typically, apparent attenuation will range from 65 to 80%. Beers with a lower apparent attenuation will be sweeter, fuller-bodied, and lower in alcohol. Higher apparent attenuation will result in a drier, thinner, higher alcohol brew. Using the 'set and forget' method of forced carbonation is the easiest and most accurate way to force carbonate kegged beer. Simply hold the temperature of your beer constant (34-38°F) then set your CO2 regulator pressure and gas your beer for a week. This will give you the consistent carbonation levels that are necessary for balancing your draft lines and taps to produce great pours. Enter the temperature of the beer to carbonate and your target Co2 volume. Naturally carbonating your beer should be done soon after your beer has reached it's final gravity, which is based on getting the same hydrometer reading two or more days apart. Adding the right amount of fermentable sugar to the beer will provide the yeast with just enough food for them to create the right amount of CO2 needed to hit your carbonation level. Remember when using the calculator be sure to input the 'warmest' temperature the beer has reached prior to bottling it, colder beer holds CO2 in solution better than warmer beer which allows CO2 to escape easier. Enter your target CO2 volume, beer temperature, beer volume and priming ingredient. from this calculator. Always take care when entering data and/or using the results of your calculations. Use this calculator to figure out how to bottle beer in the exact combination you desire. Wort gravity, Volume, Alpha Acid, Ounces and Boil Time then click 'Calculate'. The BJCP Style Guidelines state the desired number of International Bittering Units (IBU) that are needed to obtain a balance between hopped bitterness and malt sweetness in a hopped beer style. Beers that don't taste sweet or bitter are considered to be balanced, although individual beer drinkers may percieve this differently. The formula used in this calculator returns the desired IBUs needed to keep a hopped beer style in balance using the formulas published on the Beer Color and Brewer's Math website. The formula takes into consideration the beer's original gravity, actual attenuation and bittering level but does not take into account phenol, ester or other complexities. The beer drinker should use the desired IBUs as a reference point and decide for themselves what they consider to be balanced. Mash temperatures play a significant role in the creation of your wort and the beer that is made from it. Many brewing publications agree that the optimum temperature range for an infusion mash ranges from 147°F to 155°F. A mash done at the lower end of this range will produce a well attenuated lower gravity beer and a mash done at the higher end of the range will produce a dextrinous higher gravity beer. It is important to hit your required mash temperature as early as possible when adding your hot water to the grains. Within the first 5 minutes of the mash is when the enzymes are the most active and when they will produce the most fermentable sugars. Needless to say if you unintentionally go in too hot with your strike water you will overshoot your final gravity so it's important to heat your strike water correctly at the very start of the mash. The formulas used in the calculators below are based on the earlier work of Ken Schwartz as published on Green Bay Rackers and have been modified for use on this site. The calculators have been tested but you should note that they are meant to provide you with approximate recommendations as they do not take into account differences in your equiptment or brewing process. Use care when entering your input data, avoid typos as the calculators will crunch them as well as correct input data. To get the most from your calculations use the output values as a starting point and be sure to write down your actual results as they pertain to your brewing equipment. Using your notes as a reference when calculating your next mash will help you fine tune differences in the surface area, volume, temperature and heat loss of your current equiptment. To calculate the Required Strike Temperature you will need to heat your water to in order to hit your Target Strike Temperature enter the following information. To calculate the Amount Of Boiling Water you will need to raise your mash water to in order to hit your Target Strike Temperature enter the following information. To calculate the Amount Of Space your mash will require, including grains and water, enter the following information. Enter the Percentage of grains, in pounds, ounces or grams, to calculate the total weight. The default weight of 10 pounds of grains is used in the example below. Enter the Radius and Height of the cylinder, in feet or inches, to calculate it's volume. The volume of a hydrometer tube 10 inches tall and 1 inch in diameter is calculated below. 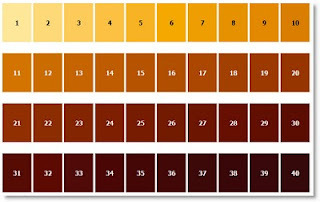 Note that SRM is a measure of beer color density more than hue/tint. 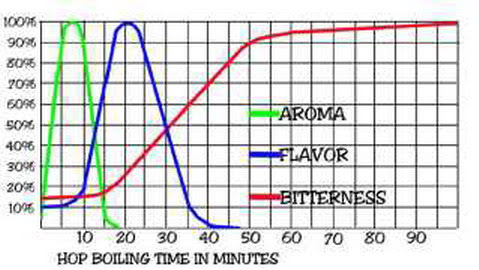 Keep this in mind when attempting to use only SRM numbers when describing beers. 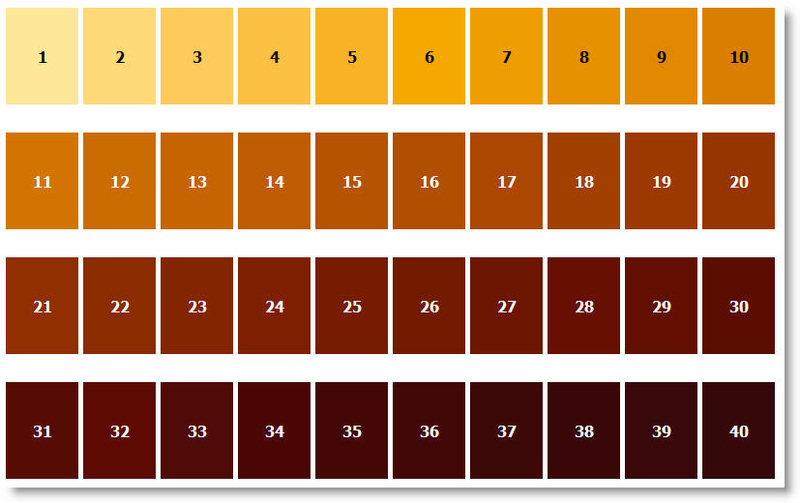 Within these Guidelines, beer color descriptors generally follow this mapping to SRM values. Boiling hops for more than 60 minutes doesn't contribute much more bitterness since most of the hop oil isomerization happens earlier in the boil . Maximize hop flavor by boiling them for no more than 20 minutes and to get the most hop aroma boil them for 7 minutes or less. Additional ways of increasing hop aroma is to add them at the very end of the boil and leave them in the kettle as the wort cools. You can also add aroma hops to the fermentor about 4 days after pitching your yeast or 14 days before bottling or kegging.